This week, some of the CSA shares included a couple of green beans. The seeds went in just around the frost free date (mid-May) and more a few weeks after that, and will produce for weeks to come. Beans climb like crazy. Some days it feels like 2-3 feet have been covered by each plant. There is a system of plastic covering the ground (to block weeds) and wires running with jute strings running zig zag all over. The strings run about 7 feet up, and the beans will cover every inch of that string. 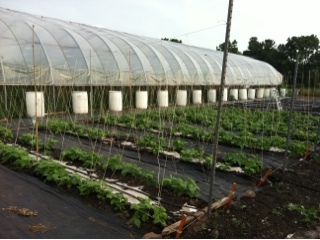 With the areas between the plants covered with plastic, we will be able to get in there and pick easily. The strings allow us to pick from either side. 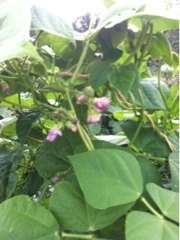 If you are looking for us in the evenings, we will be out back picking beans. 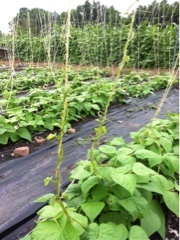 The best thing to do for a bean plant is to pull every one while they are thin and tender, the plant will then produce more. At the end of the season we will take down the strings, by then covered with dead vines, and burn them. Next year we will grow beans in a different spot, in an effort to confuse the bean beetle. And feed the soil. The plastic will be used for years to come. We are careful not to tear it so it stays intact. If it gets torn it no longer has value as weed block. And the butterflies are visiting. 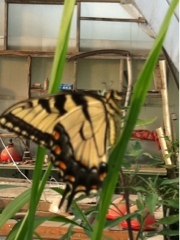 Right now it's all about swallowtails.